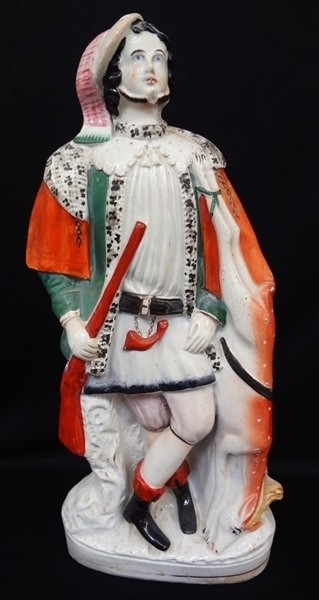 Staffordshire Figure 19th Century Hunter with Antelope 17.5 inches tall circa 1870's: Early Staffordshire figure of a Scottish hunter with kilt, standing on his catch. Stands 17.5 inches tall, 7.5 inches wide, and 3.25 inches deep. Circa 1870's. 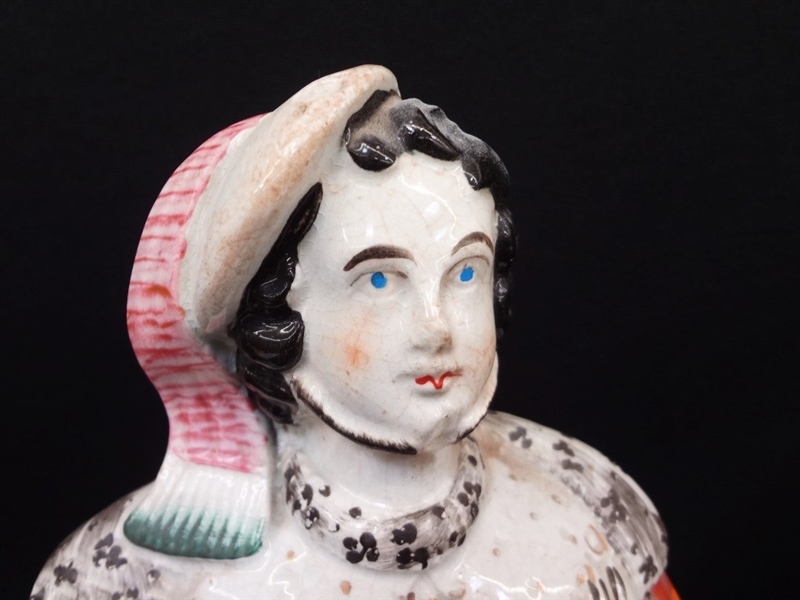 All of the Staffordshire Figures and dogs listed in this auction are early Staffordshire pieces. All of the holes on the pieces are called firing holes, and are not casting holes which would represent a modern piece. Firing holes were made to allow the release of expanding gases as the pieces were firing. These are older pieces made in press molds, not slip molds. Modern reproductions have casting holes which typically measure the size of a dime. All of the original older pieces vary slightly in height, where modern pieces are typically exact in size. Slip molding had larger casting holes because they poured the slip clay out of the mold. 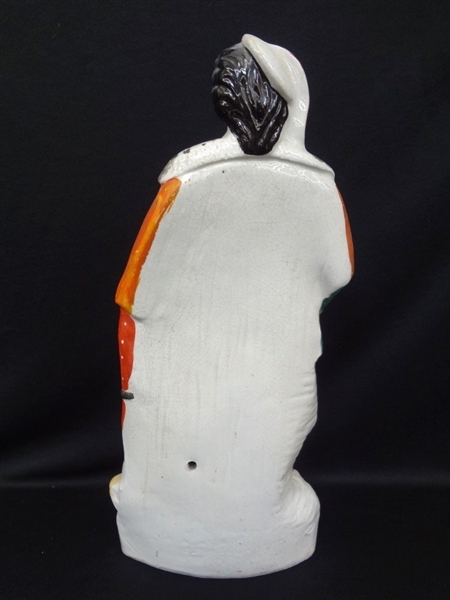 Another telltale difference between new and old is that on new Staffordshire Figures there is little or no paint on the back. 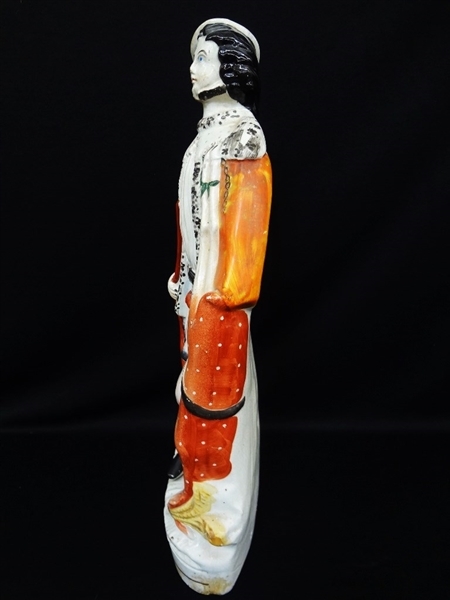 Most or all Original Staffordshire Figurines have some hand painting on the back. The Staffordshire spaniel is tied to the history of the King Charles Spaniel.